It’s time to face the fact that the cod fishery in New England is on the verge of collapse. The problem has been a long time coming. Decades of heavy fishing pressure, federal subsidies, counterproductive political intervention, unpredictable science, inadequate catch data and now climate change, have brought the iconic cod fishery to its knees. The calls for a closure are increasing and it’s getting harder to justify opposition to such a move. Some would say this centuries old fishery, a staple of New England, needs a miracle. But what it really needs is leadership. Now is the time for our leaders to step up and make hard choices. Are we going to let New England’s cod become a relic? Or are we going to reverse the tide and do everything necessary to bring this important fishery back from the brink? 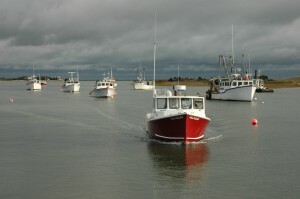 Years ago, fishing boats going to the Gulf of Maine in search of cod would return with an abundance of fish. Early fishermen claimed the schools were so dense, and the fish so large, that fishermen could walk on their backs. Today, boats return with just a small fraction of what they once caught. According to a recent peer-reviewed NOAA survey, cod stocks have dwindled to just 3 percent of what is required to sustain a healthy population. The dire numbers associated with this current crisis are decades in the making. In the 1980s and 90s, poor management and federal subsidies enabled the growth of a fishing fleet that was already too large and investments by many fishermen in better technology to find and catch cod. While there were a few attempts to stem overcapacity in the 90s, numerous crises in the fishery undermined those efforts even then. Excessive fishing pressure continued and accelerated in the 2000s with overly optimistic stock assessments. Catch levels became too high for the stocks to handle, which undermined the ability to recover, causing reproductive challenges and poor growth, among other problems. As a result, the cod population and its resilience has continually decreased and weakened over time. In recent years, cod assessments have continued to be overly optimistic in estimates of abundance, leading to catch limits that were set too high for stocks to sustain. Other challenges, such as climate change, are also starting to have an impact, and will pose significant challenges in the future. North Atlantic waters are warming dramatically, shifting the migration patterns of many fish species, including cod, while also altering predator-prey relationships in the marine ecosystem. Between 1982 and 2004, water temperatures in the Gulf of Maine increased at about 0.05 degrees per year. Since then, they have been warming at about half a degree a year – almost ten times faster. But one of the issues affecting the fishery that has gotten little attention is the role of politics. Every step taken or considered to save the stock and the industry becomes front-page fodder for Bay State politicians, from the city halls in the port cities to the governor’s office on Beacon Hill and all the way to the US Congress. And for states that are normally pro-environment, this political bent remains populist and almost completely on the side of unsustainable catch limits and minimal oversight – a stance that plays well in political ads and on the campaign trail but offers nothing for sustainability. For years, empty rhetoric has fueled the false hope of fishermen across New England. More cuts are coming to the Gulf of Maine cod fishery and there is no disputing that more changes are needed to reverse the decline we are facing. We find ourselves at the brink of collapse, very close to becoming a footnote in history like Newfoundland’s cod fishery. There, a complete collapse of the 400 year-old fishery in 1992 led to a moratorium on fishing that left more than 30,000 people without jobs. That moratorium still exists today. Here in New England, there are already voices calling for closure of the fishery, and with no change that could soon become a reality. The good news is we have a choice. We can either change our attitude, recognizing the reality and working to find new solutions, or choose to do nothing new as New England cod goes from an industry to a memory. The time for tinkering at the edges is over. In order to rebuild the stock and ensure the future of the New England cod fishery, we need immediate action and meaningful leadership, not lawsuits and false hope. Fishermen and the rest of New England deserve better. Though none of the needed changes will be easy, they are necessary. In the immediate-term, overall catch limits needed to be lowered so that we can give cod an immediate start to recovery, and we were glad to see the New England Fisheries Management Council take action to that end this week. Given that the Gulf of Maine cod stock is a dismal three percent of what it should be, fishermen are already catching well below their yearly quota. But returning to the ineffective policies of old, like daily trip limits, will not work. Those measures have been proven to fail. They will further threaten the very stock we need to protect by forcing fishermen to throw back dead fish, and will cut short desperately needed catch data. Daily trip limits and other effort controls haven’t worked in the past, and they won’t work now. Cultivating young cod stocks is also critical to ensure the future of the fishery. In order to aggressively promote reproduction and growth, temporary closures to protect vital spawning activity and spawning sites during spawning season should be continued for next fishing year. Most importantly, there remains a fundamental flaw in New England fisheries management – we simply do not know what is happening with cod in large part because we do not know what is happening on fishing boats. Only a mere 20 percent of fishing trips in New England have any form of monitoring at all. Monitoring a fishery at such a low level is ineffectual. Simply put: If political or NOAA leaders want to save the fishery, they need to put cost-effective monitoring on every single groundfish fishing boat. We can’t continue to operate in the dark. The fishery is too important. Increasing monitoring to 100% accountability over the short-term is paramount, and we urge NOAA and the New England congressional delegations and legislatures, particularly in Massachusetts, to work together to find the money annually needed for that effort. But we are not without hopeful examples for change. Fishermen in the West Coast groundfishery had a federal disaster declaration hanging around their neck a little more than a decade ago. After some hard work and tough choices, that same fishery is considered a model for sustainability today. We in New England can do the same. The Pacific groundfish fishery proved that monitoring is an investment worth making. Following the implementation of a management system that mandated 100% monitoring and accountability, that fishery saw more accurate science and the rebound of several stocks, and fishermen have been able to develop innovative ways to avoid stocks more constraining than cod is now here in New England. Today, the fishery is MSC-certified and featured in Whole Foods television ads. They’ve won awards, accolades and are a shining example. But it was all enabled through a management system that included 100% accountability and effective monitoring. Over the longer-term, there are several initiatives that will be keys to protecting cod and the fishing families, communities and consumers that rely on this species. In a constantly changing climate, it’s imperative that we develop better ecosystem science. More data about prey, growth, environmental factors and spatial distribution will help us better understand what is happening to this species and lead to more accurate assessments and catch limits. In addition, the use of peer-reviewed, third party data should be incorporated, as it is with VIMS and industry-funded SMAST annual stock assessment surveys in the scallop fishery. By doing so we are tapping into available resources to create a more accurate and reliable picture of the marine environment. Despite these challenges, we are seeing some promising signs. Many fishermen are exploring better strategies to avoid catching cod, and they are proactively working on new avoidance techniques and measures. These efforts should continue to be widely recognized and supported. In addition, we can be more creative and tap into the market of fish abundant in local waters. New consumer marketing strategies to help promote and create demand for these sustainable and plentiful fish, such as Pollock and redfish, will help fishermen survive this difficult period and enable cod stocks to rebuild. This time of crisis requires all hands on deck. The cod crisis is one we must face together – collectively making the difficult decisions necessary to save the New England cod fishery and ensure the future of this industry for the next century. This entry was posted in Domestic, New England and tagged call to action, challenges, Cod, Gulf of Maine, Monitoring, solutions. Bookmark the permalink. Both comments and trackbacks are currently closed.